This painting was copied from a photograph. I wanted to capture the dog's expression of interest on its face, but what exactly it is looking at is a mystery. Perhaps it is a gun dog waiting to collect its prize or it may just be listening to its master voice. How much would an artwork like this cost? This painting was done as a commission for a lady who wanted a unique gift for her daughter of her 2 chrished horses Ben and Jasper. Ben is the brown horse with the white flash and Jasper is the Chestnut horse. As Jasper is 30 years of age he is quite an elderly horse, and I hope that the painting will be a fitting tribute to him when he is no longer with them. I wanted to paint something different to my usual portraits and decided that horse racing would be a good subject. I have tried to capture as much movement as possible to make the horses look as if they are really running for the finish line. *Please note that there has been some camera flash captured on this image. I loved the happy expression on this dogs face and the beautiful golden honey tones in its coat. I kept the background very dark to contrast with the highlights on the fur. This painting was a commission piece, and was of a much loved pet Springer Spaniel called Dylan. It was to be a Christmas present from a daughter to her father in memory of their precious pet dog who sadly passed away a few months earlier. "Thank you so much for the wonderful painting of Dylan. It was a great idea for a Christmas present! My dad loved it and straight away commented on how you'd captured Dylan's character and quirky features. It has now taken pride of place on our living room wall." This was a commission piece that I painted for a close friend in 2007. It was to be a birthday gift from her parents as she has 5 horses but this particular one was the eldest at 24 years old. This is one in a series of oil paintings that I did showing detailed faces of cats. All of these paintings were done exclusively for sale in a gallery. This particular painting was done for an exhibition and so includes the frame. I work from photographs for all of my portraits and I managed to paint this picture using only 2 photos that his owner gave to me. Toby is a real character and he was a joy to paint. This is another painting that I did for an exhibition. I chose to paint a Kingfisher because I love the beautiful colourings that they possess, with their blue/green wings and head contrasting with the flash of red that shows on the chest feathers and underneath the eye. I decided to keep the background plain so that it would not conflict with the brightly coloured bird in the foreground. 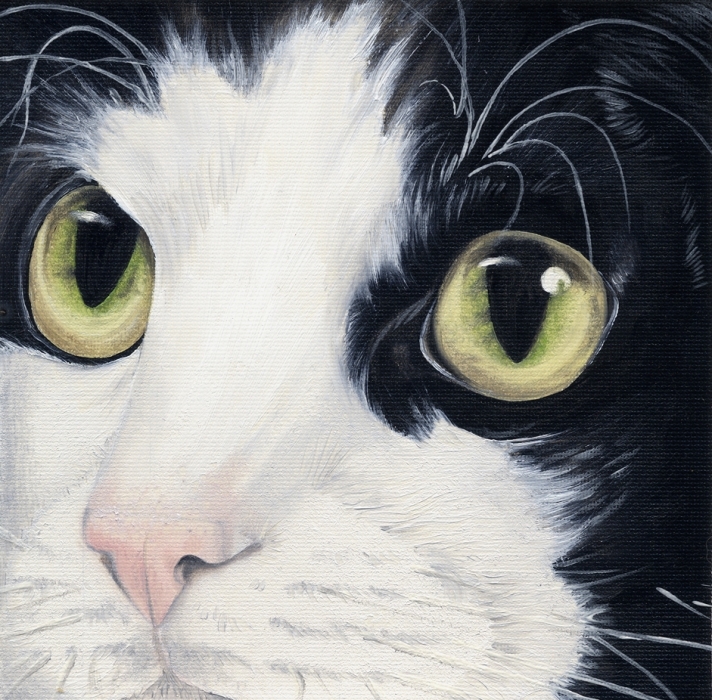 This drawing was done along with 5 other oil paintings of detailed cats' faces exclusively for sale in a gallery. This cute little kitty was yet another exhibition piece. I used pencil for the main body of the picture and then added accents of blue for the eyes and background to make it more interesting. This drawing was commissioned by a lovely lady who lives in Johannesburg in South Africa. She was over here in England and had seen one of my adverts; she then told me that the drawing was to be a Christmas gift to her daughter of their 2 much loved pet dogs. It is an amazing thought that one of my drawings will actually be hanging on a wall so many miles away from home.